The garden is beginning to stir a bit after several days of well above average temperatures. Here and there, the tips of leaves are beginning to break through the surface. The ground is squishy, saturated from the melted snow and ice. As I walk about trying to not to leave giant footprints in the mud, the memory of the garden encased in ice just two weeks and a few days ago is fading. The witch hazel, Hamamelis vernalis, planted last fall, is finally, truly blooming. 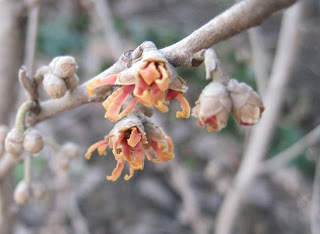 I’ve wanted to add a witch hazel to the garden for several years now, so that I could have something with some scent that would bloom in February. It does have a nice scent, which you can smell if you tip toe through the mud over to it and get up close. As the witch hazel grows and the number of blooms increases, I hope to be able to stand away from it and smell it. Elsewhere in the garden, there are more signs of the end of winter, including the common weed henbit, showing up in odd places here and there. The best time to pull henbit is now, while the ground is soft and the weeds are small. But I had no time for weeding yesterday. I merely had time to find the first hint of a crocus bloom. This bloom brings a flood of questions to mind. Did I do enough over the winter to be ready for spring? Are my seeds ordered? Did I exercise enough so that the first day I spend in the garden won’t be followed by aches and pains from bending, reaching, and gardening? When will I find the time to do all I want to do in the garden? Why is life so busy? What was it I was going to get done over the winter? It's a great time of year, isn't it Carol? I'm just itchin' to get out there! apparently I will still have some time to get on the stick and get things done before my garden thaws...I needed that kick in the pants to get moving..although I will still be full of aches and pains after the first few days of heavy time in the garden..but I can't wait!! First crocus bloom of the spring. How exciting! What's the succulent-looking plant next to the blooming crocus? 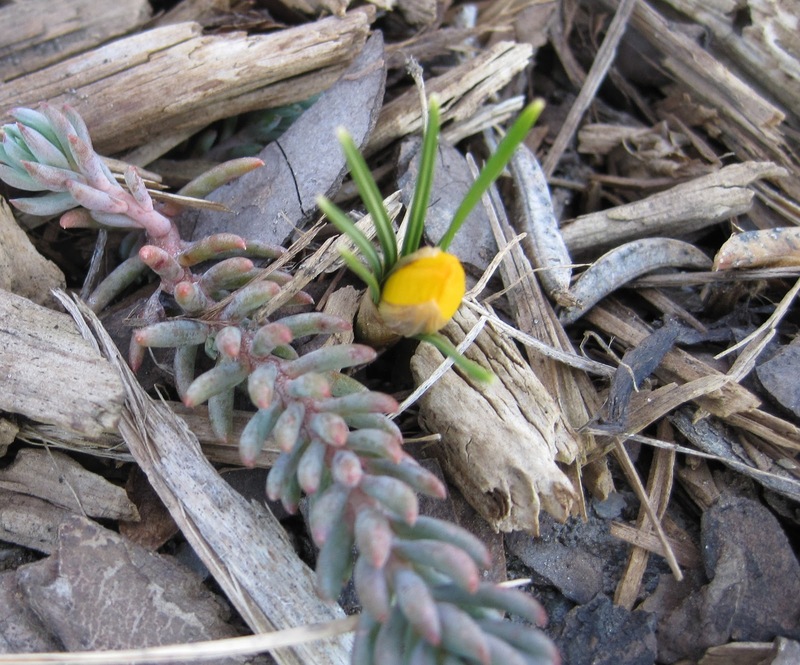 The first crocus-a wonderful sight! Can't wait until spring is here. It has been a long winter and your crocus blooming is just what the doctor ordered! Thanks for the uplift! The first signs of life in the garden make for some of the best garden days, all full of potential and anticipation. It is so beautiful when the first bloom are in our garden. I forget the bad weather, and I just look at those colors. Carol, thank you so much for giving us hope!! 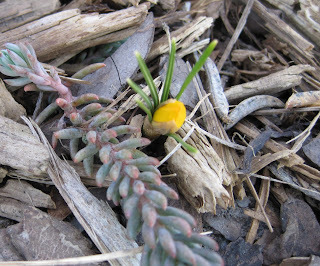 I will go back in my blog to see how far my crocus are behind yours! Good luck in the garden Carol. It is exciting to see the garden start to come to life. Carol, with more flowers on your witch hazel you'll be able to catch the scent on the breeze~Especially on warm day. It's a lovely photo! gail PS I can't believe you have crocus before my Nashville garden! I can't wait for the first blooms in my garden but I'm thinking they're still at LEAST a month away if not more. I'm so jealous! We had warm weather and still no shoots yet. Now the snow has returned and time to wait it out. Your questions sound so familiar and I try to put them out of my mind and just take gardening one day at a time.